Sympathy seems to be turning back toward Tom Cruise. In Premiere, Oscar hopeful Forest Whitaker says that it's fine for Cruise to be a Scientologist if he wants to. And in Toronto last week, Michael Moore also defended the movie star: "It's time to stop picking on Tom Cruise," he said during an interview at the Elgin Theatre with Larry Charles. "What is the man's crime? That he jumped on Oprah's couch? He's a little crazy. He's an actor! You can't be an actor unless you are a little different than an accountant and you get excited and depressed. His religion is his own. He's not firing rockets into Israel." At which point Moore segued to the subject of Mel Gibson, revealing for the first time that Gibson cost Moore his chance to be a Time Man of the Year. "I got a call right after the '04 election," Moore said, "from an editor from Time Magazine. He said, 'Time Magazine has picked you and Mel Gibson to be Time's Person of the Year to put on the cover, Right and Left, Mel and Mike. The only thing you have to do is pose for a picture with each other. And do an interview together.' I said 'OK.' They call Mel up, he agrees. They set the date and time in LA. I'm to fly there. He's flying from Australia. Something happens when he gets home. 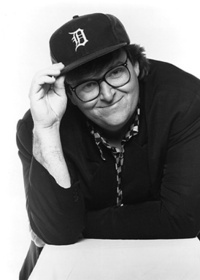 Maybe he went to church for guidance and God spoke to him and said, 'No way you're doing a cover with Michael Moore.'" (laughter) "Next thing, Mel calls up and says, 'I'm not doing it. I've thought it over and it is not the right thing to do.' So they put Bush on the cover." » Soma online sales. from Link domain purchase online soma a biz.